Many times, I have been asked with whom I undertake my journeys. Sometimes it is Jonas, often André and all the other fly fishing lads. But more often than not, I am by myself. This surprises many. Nowadays, it seems frowned upon to undertake something alone. Take a minute and think about my wording. How does on your own, alone, by yourself, solo sound to you? What kind of association do you have? Sometimes, the urgent need to go fly fishing alone arises in me. Usually this happens, when the hurries from everyday life overburden me. It makes me want to leave places and people behind. In this sense it is an extreme urge of taking time off – of everything. This urge functions as my non-medical stress relief. As egoistically as it sounds, but you are the closest person to yourself. Above all, you do best by making yourself a likeable person for you and venturing solo outside, allows you to explore yourself. You can fish your own pace. You can not blame anyone else for your misfortune. 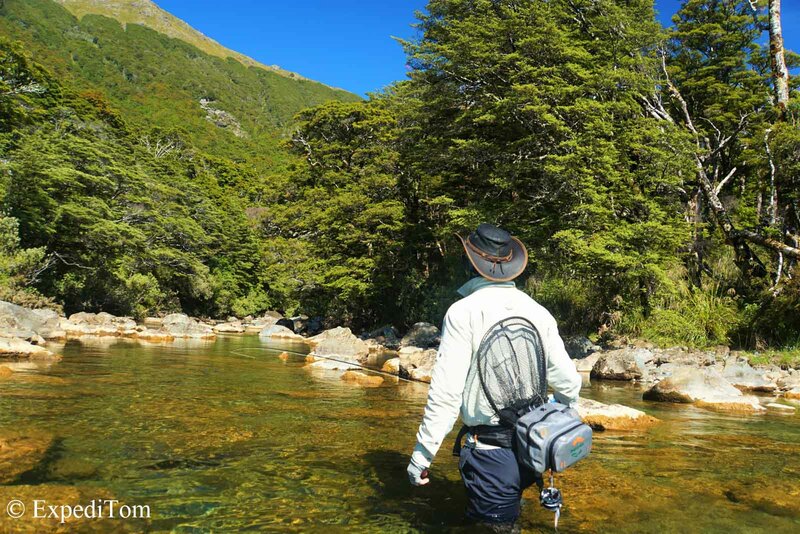 As positive as fly fishing on your own and in general is, there are some downsides. First and foremost, there is no one to share the memories with. At least not directly. No one will ever witness the moments as you did right now (can someone even if he’s there at the same moment?). Further reading about this Swiss Alps overnight fly fishing trip. Recently, I have read a long insta post by my friend Skylar from Canada on mental health. Let me tell you this, it is not always easy to be an itinerant angler. Many people show only the beautiful side of one’s adventures. I tried to counter this. For instance, in this behind-the-scenes of Chile. The trip was a disaster. On this solo week in Chile, I found out something interesting. In order to enjoy time by myself, I need about one week to get accustomed to being on my own. While in Chile, I was a mere shadow of my former self and mentally imbalanced – to say the least. After 7 days, I begin to live up again and found pleasure in the moment. Thus, to know myself better and what I really wanted, was the push I needed to get things done. Moreover, this time frame of one week seems to only apply for far away adventures with no chance of meeting any known faces. Regarding Chile, I could not even speak Spanish properly. In contrast, here at home I have no problem to venture solo for a day or two. This relieves my spirits extremely. When you pursue your dreams, it requires to do things on your own at some point. This is not always easy. If you have any questions, post them in the comment section below or contact me here.